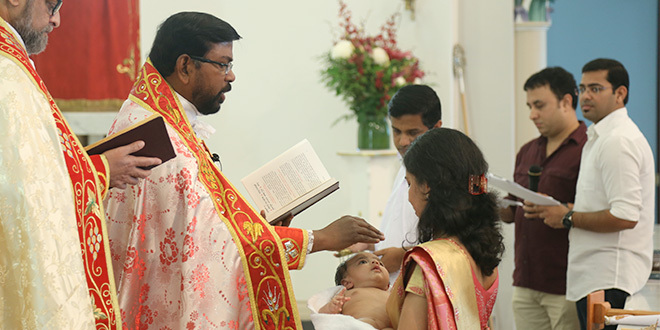 FOUR-month-old Joshua Thomas has received a unique and historic welcome into the Catholic Church becoming the first Syro-Malankara baptism in Brisbane. 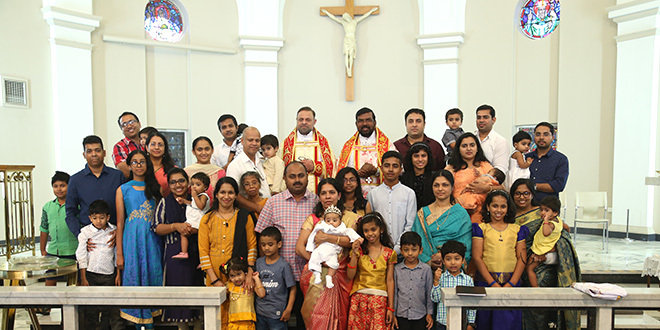 Co-ordinator of the Syro-Malankara community in Australia Fr Stephen Kulathumkarotte baptised Joshua with Fr Prem Kumar Rethnamony at St Agatha’s Church, Clayfield, during a small, but vibrant celebration. The Syro-Malankara Church has close to 500,000 members – the majority live in the southern Indian state of Kerala. Members of the Syro-Malankara Church trace their origins to St Thomas, who is said to have built churches in India in 52 AD. About 25 families in Brisbane identify themselves as Syro Malankara. “While the Latin, Syro-Malabar, and Syro-Malankara churches have their own hierarchy, histories and cultural practices, the particular forms of liturgy in each of the Syrian churches are what distinguishes the church in the minds of clergy and laity,” St Agatha’s assistant parish priest Fr Rethnamony said. He is also pastor to the Syro-Malankara Catholic community in Brisbane. “Preservation of that form is extremely important to Syro-Malankara Catholics,” Fr Rethnamony said. Big day: The family and friends of little Joshua Thomas after his baptism. Fr Rethnamony said the Malankara liturgy was “soaked in music” and “includes incense, bells and rich vestments to convey the sense of mystery”. “Chant is deeply integral to the liturgy, not simply an optional frame for it,” he said. Pope Pius XI officially established the movement in 1932 under the leadership of its founder Archbishop Aboon Geevarghese Mar Ivanios. The Syro-Malankara Church is in full communion with the pope and the worldwide Catholic Church.